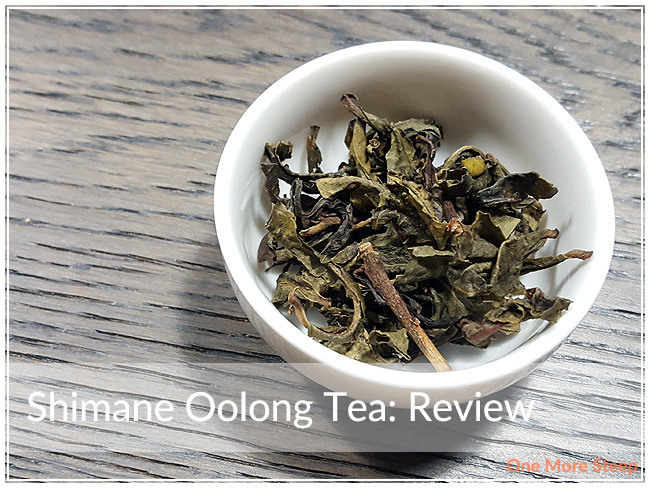 Yunomi has provided me with Shimane Oolong Tea for the purposes of providing an honest review. Shimane Oolong Tea is part of Yunomi’s collection of teas from the Takarabako Tea Farm, located in Oba Sorayama District, Matsue City, Shimane Prefecture, Japan. 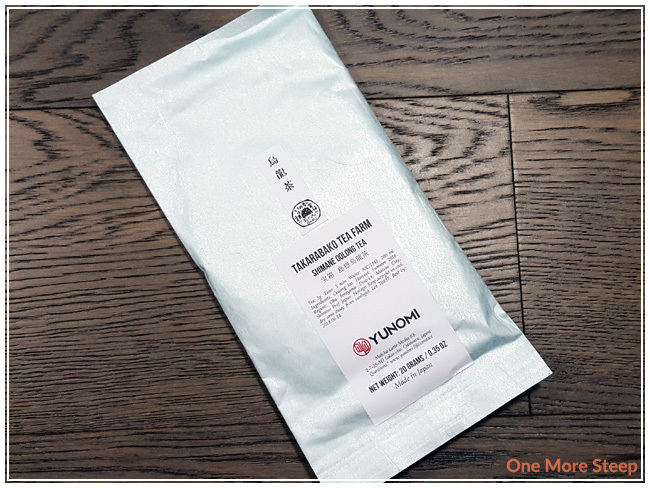 While the sample packaging for this tea was not resealable, it has a soft, papery feel to the outside of the foil bag. 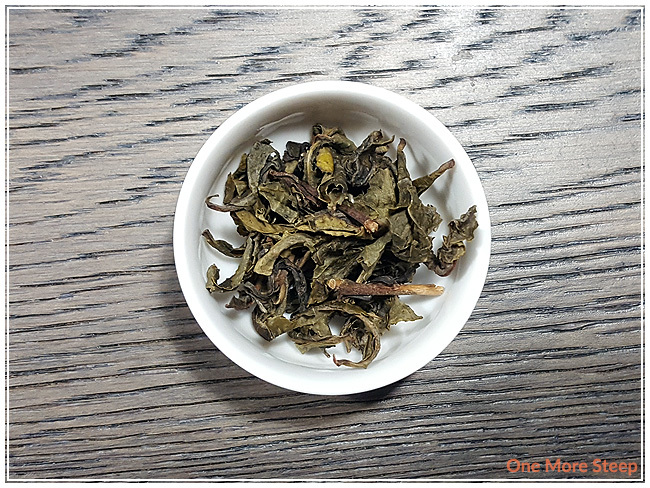 Shimane Oolong Tea is described as being organic on Yunomi’s product page for this tea. It is a straight oolong tea, and I was pleasantly greeted with the aroma of this tea when I cut open the packaging. The dry leaf smells like golden raisins and freshly made toast. Inside, the dry leaf consists of mostly medium sized leaves with some broken stems. Yunomi recommends steeping Shimane Oolong Tea in 90°C (194°F) water for 3 minutes. I did my initial steep for 3 minutes. 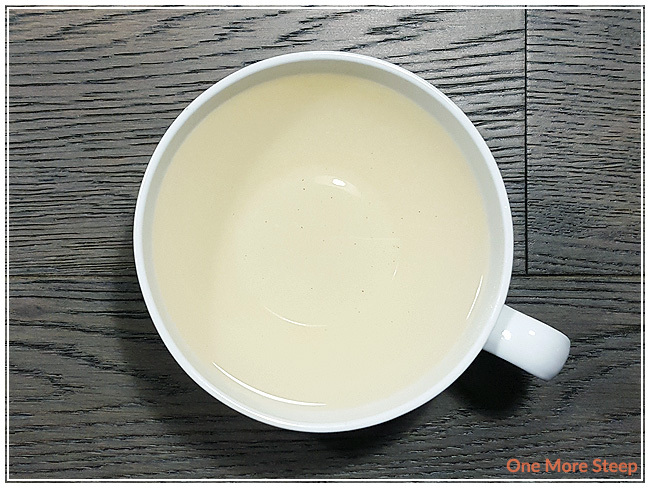 Shimane Oolong Tea steeps to a pale honey colour, the aroma of this tea is primarily golden raisins with something that reminds me of peaches. The tea itself has a very mild astringency, not too much that it caused me any mouth-puckering. It has a slight sweetness, which goes well with the raisins and peaches, and it also has a refreshing crispness to the tea. Each sip of this oolong ended with a slight bitterness, I didn’t find it incredibly off-putting so I continue to drink the tea. I chilled a cup of Shimane Oolong Tea in the fridge and it’s delicious cold as well, in case you’re not feeling like a hot cup of tea during the hot summer days. I resteeped Shimane Oolong Tea eight times over the course of a day. I wasn’t overly careful with my steeping times towards the end, but the tea remained tasty with the flavours of golden raisins and peaches. 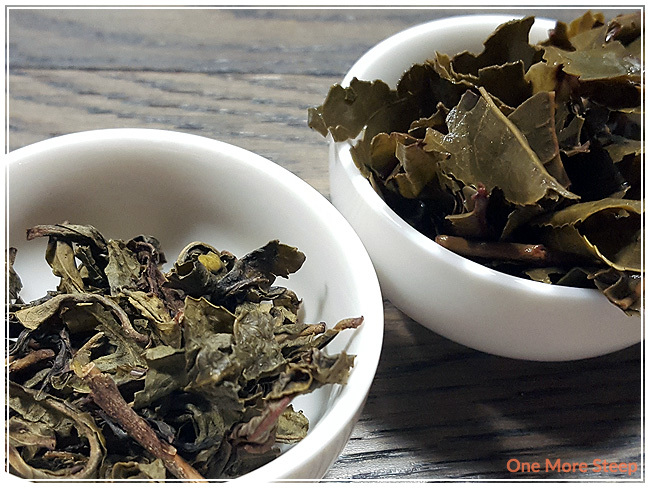 I found that astringency remained in the tea throughout all the steeping of these leaves, but it wasn’t overwhelming. If you’re not a fan of astringent teas, I would recommend steeping for less time for the initial steep. The tea itself got to be a more golden yellow colour, and began to lose flavour by the seventh resteep. The bitterness that I had encountered at the end of each sip lingered on throughout all of the steeps. I loved Yunomi’s Shimane Ooolong Tea. I found that this oolong was quite tasty. There was such a complexity to the aroma and the flavours of this tea, that it was really enjoyable to drink. If you’re not a fan of astringency, I would recommend steeping less than the suggested length of time. The flavours are well balanced in this tea, both for the initial steep and the subsequent resteeps. I think this would be a great tea to have with a savoury meal because it’s not too sweet (even with the flavours of golden raisins and peaches), and it’s definitely a tea that I think should be resteeped again and again because the tea leaves are such high quality.